At the Scarcella Law Offices, we've dedicated our practice to helping individuals overcome the impact of personal injury by achieving a measure of financial justice. We can bring those responsible for causing injury or death before a court of law and demand compensation. Our reputation is built on the skill of our attorneys and the strength of our one-on-one service to clients. You pay no attorneys' fees unless we recover compensation on your behalf. 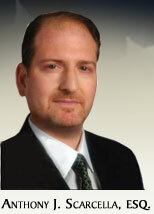 Contact a New York personal injury attorney for a free consultation. Our established law firm serves clients throughout the New York York area, including all NYC boroughs and Putnam, Rockland, and Westchester counties. You can call us 24 hours a day. Our lawyers have obtained substantial recoveries across a wide range of personal injury claims. We provide experienced and attentive service to victims while vigorously pursuing full compensation for any accident or negligence. Scarcella Law Offices practices exclusively personal injury law. We believe our clients are better served by attorneys who have cultivated knowledge, negotiation, and litigation skills in a focused area of the law. We understand how the courts, insurance companies, manufacturers, and healthcare industry respond to claims against them, and we're prepared to fight for our clients' rights accordingly. Simply fill in the form below & we'll send your FREE gift right away. There is no obligation, limit of 1 Free Gift Per Household. Contact a New York personal injury lawyer of Scarcella Law Offices for a free consultation, we can discuss the facts of your case and your pursuit of financial compensation. Home visits, evening and weekend appointments are available. Westchester County, Bronx County, Kings County, New York County, Queens County, and other counties within the state of New York.